Hey guys! Charlie here, aka Josie’s better half 😉 Josie is away on a work trip at the moment in Austin but didn’t want to let a day go by without a new post going up on her blog, so I thought I’d take over the reigns for one day while she flies, to talk about my favourite products! While I did always take good care of my skin, since I’ve known Josie my skincare routine has hugely changed; she has introduced me to products which actually work for my skin (instead of ones with cool names and packaging…!) and also some new brands. Yes, every now and then I will pinch some of her products (sorry bubs!) 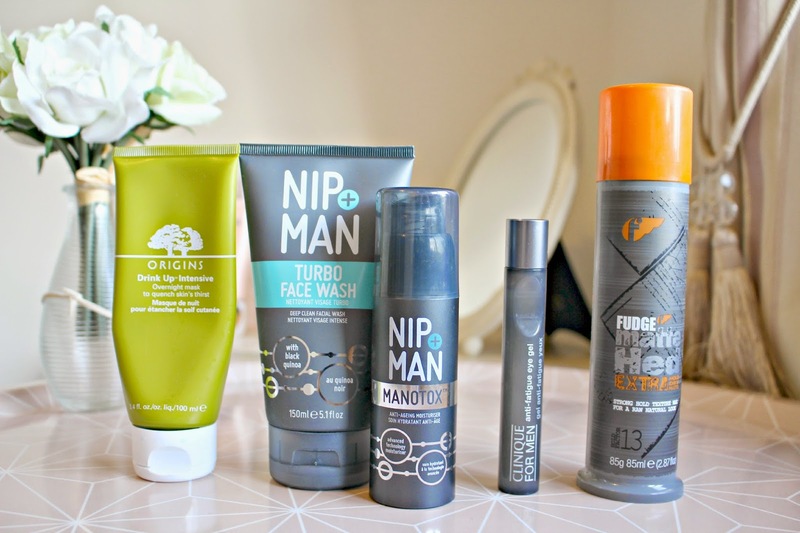 as we have the same skin type, but in order to keep hold of some sense of masculinity, I’ve been buying some products which are either unisex, or from brands which have ranges designed specifically for men. They don’t have any products designed specifically for men (as far as I know) but there are a few products which Josie loves which she has definitely got me hooked on. Firstly the Drink Up Intensive mask which you can see from the image above is nearly finished! I love the smell; it’s really fresh and seriously smells good enough to eat and I love applying it before bed if my face feels a bit tight after my shower. (I no longer wash my face with shampoo… but this did help when I used to do that!) The other Origins product which I always use is her Clear Improvement Charcoal Mask. It makes me look pretty scary but I love that you can feel it drying and pulling out all the dirt from your skin. I’ll try and find a selfie of me and Jose doing this mask together…. check out my Twitter @CharlieIrons if you want to see! Cheeky plug there…! I’ve got Jose to thank for this one, she loves Nip & Fab and I was asking her about some glycolic serum thing that she was using when she told me that they had a men’s range! I use the Turbo Face Wash in the shower to clean my face; I really like that it foams up and I feel like my skin is fresh and revitalised afterwards; plus you don’t get that annoying tight feeling afterwards because apparently there’s moisture boosting ingredients. I then use Manotox which is a moisturiser which also smooths skin and is anti-ageing. I’m not really concerned about anti-ageing yet but… prevention is better than cure! Late nights, early mornings and getting battered playing Rugby means my eyes sometimes get a bit puffy so I use the Clinique for Men Anti-Fatique Eye Gel. Not sure how this differs to the female version but I wouldn’t be caught applying some pink serum to my face! I have got into the habit of using this every morning and the silver ball is cooling on the under eye area which instantly refreshes and de-puffs. Clinique also make great face masks and scrubs for men which I also love. I don’t use anything else in my hair. I have really short hair so don’t tend to experiment much, and all I need is something to stop my hair looking fluffy after I get out the shower, so the Fudge Matte Head product is perfect for making my freshly washed hair look a bit more ‘lived in’. Hope you’ve enjoyed this insight into my favourite brands for men, and let me know in the comments if you’d like me to do another Boyfriend Takeover (if Josie lets me!)! That’s all from me, have a great day!